Nearly eight years after it first initiated an attempt to standardise fund factsheets, the Association of Mutual Funds of India (Amfi; the 13-trillion Indian mutual fund industry’s trade body) sent out revised guidelines on how to standardise factsheets to all fund houses. This time, it has the blessings of the capital market regulator, Securities and Exchange Board of India’s (Sebi). In a circular dated 14 September, a copy of which is with Mint, Amfi said that Sebi had observed that there was lack of uniformity despite Amfi having urged fund houses earlier. The new factsheet format has been effective from October 2015. Different ways of giving information, the circular attributed Sebi as having observed, could be confusing to the investors. We agree. Before you invest in a mutual fund (MF) scheme, it’s best to get to know as much as possible about it. Where it will invest your money, how good its performance has been, what is its objective and so on is just some of the information you’d like to get. A scheme information document (SID; formerly known as offer document) is always a good point to start. But the SID only tells you what the scheme will do; that’s not enough if you wish to invest in a scheme that is already in existence. Also, if you are already invested in a scheme and wish to check its progress, SID is not enough. Here’s where a fund factsheet comes into play. This is your starting point. Although past performance doesn’t guarantee future returns, it gives you a good indication of how your fund is likely to perform, and its pedigree. In 2011, Sebi came out with a detailed set of guidelines as to how fund houses should advertise their scheme performances. For instance, if a scheme has been in existence for at least three years, it has to give returns of unique 12-month periods for the past three years, both in terms of how a standard investment of 10,000 has grown in such time periods and in percentage terms. “All schemes are also mandated to give benchmark indices returns. You need to see if your funds beat the benchmark returns over longer time over periods of, say, two, three, five and 10 years," said Gajendra Kothari, managing director and chief executive officer, Etica Wealth Management Pvt. Ltd. Although Sebi has prescribed for three unique, one-year time periods, many fund houses go an extra mile, such as Franklin Templeton Asset Management (India) Pvt. Ltd, and give past performances across different time periods. Some others don’t. “The new method that Sebi had advocated doesn’t give a true picture of long-term wealth creation. Performance should be checked over longer time frames," said Harish Rao, coach and trainer at financial planning training unit, Simple Equations. You may have invested in an MF because you did not want to or could not pick stocks and bonds on your own. Either ways, one should check the scheme’s portfolio once in a while. Primarily, check whether your fund is adequately diversified across scrips and sectors. “We detected higher cash holdings in equity funds like Quantum Long Term Equity Fund and ICICI Prudential Dynamic Fund in the first quarter (April–June 2015) and had advised our clients to switch to other funds," said Prakash Praharaj, an investment adviser, and founder of Max Secure Financial Planners. 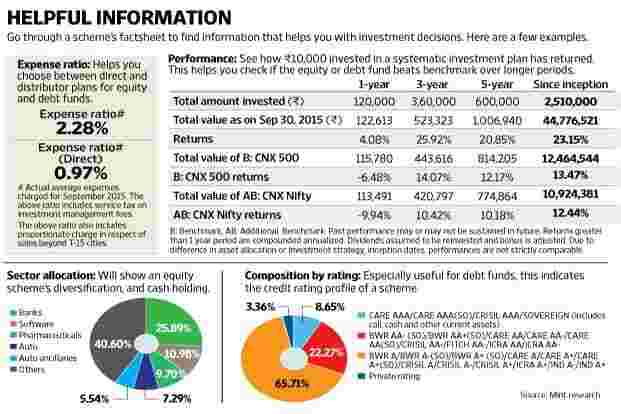 If you have invested in debt funds, take a look at credit profile. The new Amfi circular has recommended that fund houses present the credit rating profile and asset-wise breakup in either a tabular or graphical format. But that may not be enough, as demonstrated recently by the case of Amtek Auto Ltd’s downgrade. Two of JP Morgan Asset Management (India) Co. Ltd’s fixed income schemes sank sharply in August when Brickwork Ratings downgraded the company’s scrip from ‘A+’ to ‘C’. However, when rating agency CARE had suspended its ratings of Amtek Auto on 7 August 2015, the scrip was rated AA-; a rating that’s commonly seen in many fund portfolios. “Often, investors look at rating profiles and think that XYZ company or ABC company is not a candidate for default. One doesn’t lose money only due to default; one can lose money even on downgrades, albeit not of the same magnitude," said Aashish P. Somaiyaa, managing director and chief executive officer, Motilal Oswal Asset Management Co. Ltd. He suggests investors should also look at a debt fund’s exposure to “troubled sectors such as weaker non-banking financial companies and banks, global commodities, infrastructure, real estate, retailing and so on." Take a look at the expense ratio, especially if you are invested in a debt fund. The lower a debt fund’s expense ratio, the better it is for you. “I would like to see if it (expense ratio) is in line with the industry (average) numbers, both for the regular (distributor) and the direct plans," said Kothari. At the same time, keep a track of the corpus. A drastic or a continuous fall in corpus should raise red flags. For instance, according to data by Value Research, Kotak Flexi Debt’s assets fell from 1,300 crore in September 2012 to 312 crore in August 2015. IDFC Money Manager Fund-Investment Plan-Plan A’s corpus fell from 2,344 crore in September 2012 to 1,494 crore in August 2015. This doesn’t mean that such funds are bad; there may have been unavoidable factors that led to the steep reduction in corpus, but do check with your financial planner at least. “In debt funds, there is comfort to be had in a large sized fund. In fact, when institutional investors invest in debt funds, they take a look at fund sizes and avoid small-sized ones," said Rao. Some investors like to look at the dividend track record of a scheme, said Rao; something that factsheets provide. Although dividends come out of the scheme’s profits, it gives some comfort to those who want regular payouts from funds, especially senior citizens. Most factsheets give out dividend details towards the end. “Predictability of dividends has a charm for some elderly investors. Some schemes, like HDFC Equity Fund, have certain regularity in their dividend distribution pattern. Although dividends don’t mean you are getting extra money, for some investors that—and a pattern—is an attraction," said Rao. Most factsheets also have market commentary at the beginning, which tells you how the markets behaved in the preceding month. You can skip this as the language of most market commentaries leave much to be desired. “Some 40-odd fund houses write market updates. This has nothing to do with the investor or her goals. Stocks create wealth from earnings of companies but we (fund industry) write market updates. These updates make investors believe that returns are made from markets, whereas the actual role of markets is just to provide liquidity and price discovery. If the factsheet commentary is relevant to an investor’s perspective, then she should read it; otherwise, not," said Somaiyaa. Most experts advocate a regular check, though you shouldn’t go overboard. While Somaiyaa and Kothari feel a quarterly check is required, according to Rao, a half-yearly check will suffice. So, keep an eye on your factsheet and sit with your adviser or financial planner, if you have one, to get more clarity on how the scheme is doing.